Indian Society for Technical Education is a professional organization of engineering educators and educational administrators. It is a society registered under the societies Registration Act XXI of 1860. The principle objective of ISTE is to advance the cause of education in general and all its functions which pertain to engineering and also to serve as common agency for simulating and guiding its members to formulate strategies for development of technical education and research. ISTE had been engaged in a variety of programmes and actions leading to the upgradation and modernization of present day curriculum, faculty and educational infrastructure so as to make the technical education in India comparable with that in the advanced countries. PES College of Engineering, Mandya became Institutional Member of ISTE in the year 1986. ISTE-PESCE Chapter, which is a branch of Indian Society for Technical Education, New Delhi, took birth in the PES College of Engineering campus in the year 1989. Almost all the staff members of the institution are life members of ISTE. The members are benefited through attending short term courses and other activities of the ISTE. What started as an elite group 11 years ago, today has sprawled throughout the campus of PESCE making the students technically more competitive, more professional and enhancing their abilities as an engineer. Since then IEEE-PESCE student branch, a division under region 10 of IEEE has been known for the immensity with which its members were bestowed. The very success story of its students as professionals in their respective fields after graduation speaks of its standards. IEEE-PESCE is a blooming group of more than 100 active members involved in participating and organizing a range of activities aimed at enhancing their academic, professional and career lives, with the thoughtful support and guidance of mentors. IEEE-PESCE Student Branch at P E S College Of Engineering, Mandya, Karnataka, empowered to grow technically, professionally and academically to grid oneself to be technically proficient with the ebullient attitude that engenders to build a wonderful career ahead. We consider ourselves to be lucky enough to be a part of this growing family and find overwhelmed to welcome everybody to this home of people striving to be savant. This Student Branch of IEEE, budding since 2007 to create an ambiance where each can flourish by displaying their skills and be abreast with the latest developments in cutting edge technology through team meets and various other events like seminars, workshops held regularly. The most unique Social Activity wing works for something more than just an act of favor charity directed towards doing something for the society. For the efforts that we put in, we have been recognized by the IEEE Bangalore Section and awarded various awards few amongst which are the Best Branch Counsellor Award, Best Website Award and Best Student Volunteer Award. SAE Collegiate Club, a student club has been formed in the year 2007 in association with Dept of Mechanical, Automobile, Industrial Production and Engineering. Our club is affiliated to SAE INDIA organization in its Bangalore section. There are about 56898 student members in 468 engineering college throughout India. Our college club is one among them. By becoming a member of SAEINDIA college club, students become a part of a global organization whose benefits are geared specifically to the needs of the mobility engineering community. Students' formal education and professional development will be enhanced through your SAEINDIA member benefits. Presently there are 43 student members in our club. The members have organized various technical events such as PAPER PRESENTATION, EXHIBITION Competitions and Technical talks on diverse topics. Our students have participated in the BAJA Competition which will be held every year. "VIDHWEGH REnergised", "VIDHWEGH ELECTRIFIED", teams comprising of 15 members each, from our collegiate club is participating in a Hybrid event named "ELECTRIFYING GREEN ASPIRATION (EGA)", conducted by SAEINDIA-Bangalore section, which will be held in Bangalore, in the month of November-2017. Students of our collegiate club are also looking forward to take part in SUPRA-2018 and other events conducted by SAE. Dr. J .Venkatesh HOD, Dept. of Automobile Engg. B Dinesh Prabhu Asso. Professor, Dept. of Automobile Engg. The seed for the Computer Society India (CSI) was first shown in the year 1965 with a handful of IT enthusiasts who were a computer user group and felt the need to organize their activities. They also wanted to share their knowledge and exchange ideas on a fast emerging sector. Today the CSI takes pride in being the largest and most professionally managed association of and for IT professionals in INDIA. The purpose of the society is scientific and education, directed towards the advancement of the theory and practice of computer science and IT. The organization has grown to an enviable size of 100,000 strong members consisting of professionals with varied backgrounds including software developers, Scientists, Academicians, project managers, CIO's, CTO's and IT vendors to just name a few. It has spread its branches all over the country. Currently having more than 500 student branches and rooted firmly at 73 different locations, CSI has plans of opening many more chapters and activity centers in smaller towns and cities of the country. The idea is to spread the knowledge and provide opportunities to as many interested as possible. THE CSI VISION: "IT for Masses"
Keeping in mind the interest of the IT professionals and computer users CSI works towards making the profession an area of choice among all sections of the society. The promotion of Information Technology as a profession is the top priority of CSI today. To fulfill this objective, the CSI regularly organizes conferences, conventions, lectures, projects, awards. And at the same time it also ensures that regular training and skill updating are organized for the IT professionals. Education Directorate, a special wing of CSI helps physically challenged citizens by providing training 'Punarjani'. CSI also works towards a global approach, by seeking out alliances with organizations overseas that may be willing to come forward and participate in such activities. CSI also helps governments in formulating IT strategy and planning. 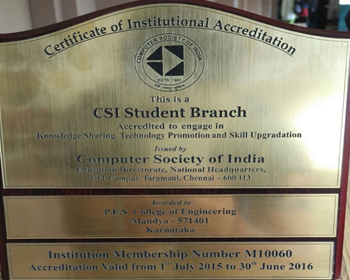 To be a part of the distinguished fraternity of famous IT industry leaders, brilliant scientists and dedicated academicians our college has attained institution membership of CSI from 1st January 2015 and it is our privilege to announce that our department has open CSI-student chapter under the leadership of our HOD Dr. M. C. Padma. With her esteem support, around 108 students have registered to become CSI members. The aim of this body is to create opportunity for students to interact with industry professionals and to organize seminars/workshops/competitions etc. The department has nominated Mrs B S Mamatha as student branch co-coordinator for CSI-student chapter and Mrs B P Chaitra & Mr. Yoga B S as nominee members. CSI core committee members are also nominated for our CSI-student chapter and the list is given below. Objective: Inauguration of Computer Society of India (CSI) student chapter in P.E.S. College of Engineering, Mandya. P.E.S College of Engineering in association with Department of Computer Science and Engineering inaugurated the Computer Society of India student chapter on 20th November, 2016. The CSI chapter of the college consist of more than 75 students including core team members. The Inauguration started with a melodious invocation song which was followed by a welcome speech by the student chair Rukshar Ahmadi who welcomed our privileged guests and addressed the gathering. Our respected principal, Dr. V. Sridhar was the chief guest to this function. Dr.Rajkumar Vedam Consultant Engineer, Houston, Texas, US inaugurated the CSI student chapter by lighting the lamp, in presence of professor and head of department of CSE, Dr M.C. Padma, Smt. 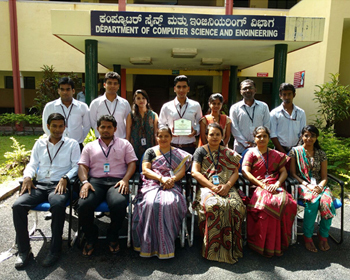 Mamatha B.S SBC, CSI-Student chapter, and all the professor of department of computer science. The event proceeded with the address speech of our beloved HOD who enlightened the students on the future goals of the chapter and shared her vision with the student. The event was more successful after the technical talk on Listening, Communication and, Career Opportunities was delivered by Mrs. Vathsala S Bhat, Dean at RIIT Mysuru. The inauguration went ahead with a short quiz event followed by vote of thanks. The overall feedback was quite positive and we hope to conduct more number of events in the upcoming days. GNU/LINUX Users have formed a group called GLUG in P.E.S. College of Engineering, Mandya. The main objective of this group is to provide awareness of free software in students. Free software means software that respects user's freedom and community. Roughly, it means that the users have the freedom to run, copy, distribute, study, change and improve the software. Thus, "free software" is a matter of liberty, not price. To understand the concept, you should think of "free" as in "free speech", not as in "free beer". GLUG campaign for these freedoms because everyone deserves them. With these freedoms, the users (both individually and collectively) control the program and what it does for them. When users don't control the program, we call it a "non-free" or "proprietary" program. The non-free program controls the users, and the developer controls the program. This makes the program an instrument of unjust power. This group is strongly supported by Free Software Movement of Karnataka (FSMK) group. GLUG, PESCE is active in conducting technical events like regular workshops, Hands-on sessions, conferences, etc. GLUG is co-ordinated by Dr. Minavathi, Professor and HOD, IS&E Department, PESCE, Mandya. Plug-In is the club which started to help the ECE department students in all the aspects to achieve the proficiency. It was the idea of Adarsh H R, Ganesh R Bhat, Ullas Gowda G L and Nandish Urs N (2013 batch students). It is the only club that has got intiated after 20 long years of closing the great HAMMING club of our department. It is the only club that our department has still today and operated by students only. It has been around one and half year of its establishment in which it has organized many events and few intra college events too from our supporting team. Today we have around 170 students who are there in our club and we are guided by our faculty advisor Mahesh Koti, Associate Professor of ECE department. Plug-In is a technical group which operates on behalf of ECE Association. Plug-In conducts both technical and non technical events. Through the activities which we conduct we are trying to enhance the skills of the individuals and making them to understand their potential, their talents in handling the situation and finding the best way to stand as a winner. To have a honest approach to explore the domain….! To provide the platform for the students to carve the best version…..! To create a tour to the mysterious world of technology…..! Quiz-In 2015 - 16 This was the first activity conducted by Plug-In. The topics were mainly on basic electronics. Talk-In 2015 - 16 This was a technical talk by Dr K A Radhakrishna Rao on Digital Image Processing. It was a industrial interaction with the students. Quest-In 2016 - 17 It was a treasure hunt event and was the most successful event organized by Plug-In wherein 200 students participated in the event. Fumour 2016 - 17 This was organized mainly to see the creativity and thinking ability of the students. Code-Kshetra 2016 - 17 It was a programming event where all the IT department students were allowed to participate and it was organized twice. Adzap 2017 - 18 It was organized to check the managerial and thinking skills of the students. MATLAB 2017 - 18 This was a workshop organized for the students of ECE department. Even Plug-In organized social activitiy. We thought about operating Computer to the government students who were not aware of that and our beloved HOD Dr K A Radhakrishna Rao sir also donated a Computer to the school.